An exotic beauty dressed in silks and gold, she sits perched on a large woven chest, and waits for her beloved. Media: Head, hands and feet of tinted Super Sculpey, on a wire armature, with a cloth body. She has long black mohair under a purple and turquoise silk brocade turban with gold trim and green veil. 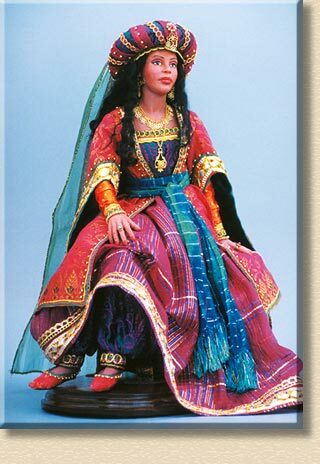 She wears pink brocade shoes, and purple and turquoise silk brocade pants and bodice with gold trim. Her skirt is a sheer metallic pink and purple plaid with gold edges. Her sleeves are orange silk with gold dots and gold trim. Her coat is pink brocade with gold and green trim. She wears a fringed cyan blue sash around her waist. Props: She sits on a purchased woven basket trunk. She has gold jewelry.